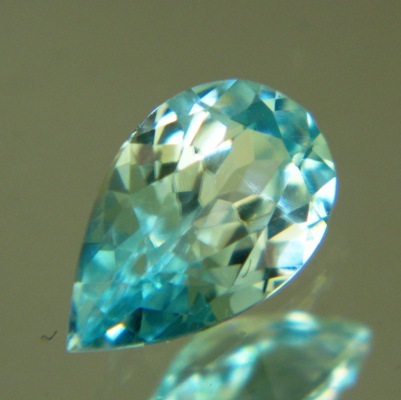 Comment: Disclosure: We do usually not copy/paste our product descriptions, but in this case we need to repeat the following: Blue Zircon (from Cambodia) has been the one gem that I regretted not to trade because they are always heated. 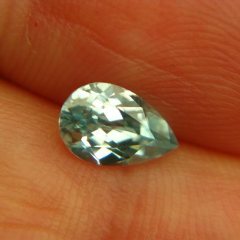 Now, I was told that an Australian gold-miner found these light blue Zircons as by-product in his mine. I was more than intrigued and after some study I'm willing to trust: the blue is very bright, the stones are all very small, they show no sign of high-heat, and there are actually reports of natural bright blue Zircons found in Australia. We conclude that these Zircons had the luck to undergo a natural geological heat process like some Citrines but that they are untreated by men. 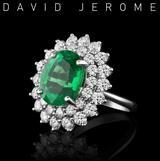 About the gem: In pear and marquise shapes it is normal that colour appears to be stronger in the tip. In this 1.11 pear shape, however, you will (after some study with the lens) realize that it actually has a lighter toned colour zone in the center, running vertical to the length. In this area the Zircon is only light 10 and sparkles like a white diamond while the rest is deeper blue: something special attesting to the fact that each natural gem is different. Slender long drop, flawless hand cutting. No inclusions, no window, IGI certified. 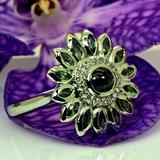 As all Zircons it comes with most powerful lustre and rainbow coloured scintillation. Always better than image. Big face: even one carat is good enough for a pendant.